Battery charge monitoring is only available in the premium version of Kaspersky Safe Kids for Android. By default, the charge of the child’s mobile device can be monitored if the location function is enabled. If the battery charge stays below 15% for more than 24 hours, you will get a notification. Open Kaspersky Safe Kids for Android on a parent’s device and unlock it with the secret code or fingerprint. Tap on the app screen. Select the child to view the battery charge on the child’s device. 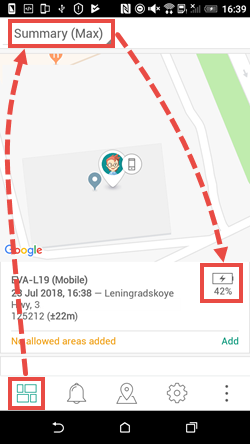 The information about the battery charge will be displayed on the map next to the device name. Also, you will see if the device is charging. To refresh the information, tap the map and repeat the steps above.